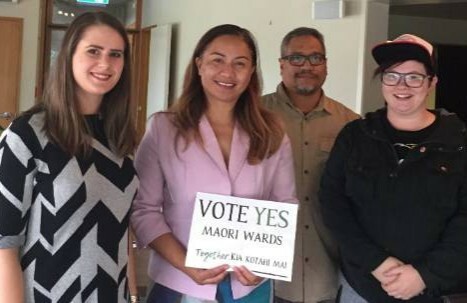 The Kia Kotahi Mai coalition campaigning for a “yes” vote in polls about guaranteeing Maori seats on councils has Green Party MP Marama Davidson on side. Davidson was in Palmerston North on Thursday to promote her bid for the party co-leadership, and met advocates for the creation of Maori wards on the city and Manawatu District councils. Her private members’ bill seeking the abolition of what she called “discriminatory” poll provisions, which had been used by ward opponents in both cases, never made it past its first reading. Councils had powers to create other sorts of [universal suffrage] wards for election purposes, such as rural or geographical wards, but only [a racist] Maori ward decision could be challenged and most likely overturned by a poll.
. . . most likely overturned by a poll? Of course, we know why the racists don’t like democracy. This sign she is holding could say ” Vote Yes for racist maori privilege at your expense”. Their greedy sense of entitlement should be an embarrassment but they are too greedy and power hungry and corrupt to see it. These pathetic racists are truly an embarrassment to most Kiwis. Marama Davidson obviously does not want democracy. Surname DAVIDSON. Use your general vote Marama like all the rest of us. Pass that message on to your other ancestor. Maori wards are a good thing. Maori wards allow council another way to disregard the wishes of the majority or do as they please, based on mythical reasons thereby avoiding logical and real world explanations.